Cells in humans and other vertebrates, as well as invertebrates, have signaling pathways that play essential roles in embryo development, cell proliferation and tissue structuring. Dysregulation in one of these signaling pathways, known as the beta-catenin-dependent Wnt signaling pathway, can cause embryo malformation and diseases such as breast cancer and cervical cancer. Researchers at the Center for Medicinal Chemistry (CQMED) have discovered a way to regulate this pathway. Created with support from São Paulo Research Foundation - FAPESP through its Research Partnership for Technological Innovation program (PITE), CQMED is a unit of the Brazilian Agency for Industrial Research and Innovation (EMBRAPII) that specializes in biopharmaceuticals and pharmaceuticals, comprising researchers from the University of Campinas's Center for Molecular Biology and Genetic Engineering (CBMEG) and the same university's Biology Institute (IB-UNICAMP). The study was a collaboration between laboratories from the SGC at UNICAMP, the University of North Carolina at Chapel Hill (USA), the University of Oxford (UK), the Goethe University Frankfurt (Germany), and other research institutions located in the United States, United Kingdom and Japan. The results have been published in the journal Cell Reports. "Using a chemically synthesized compound we've developed over the last few years, we were able to advance our understanding of the regulation of the beta-catenin-dependent Wnt signaling pathway," Roberta Regina Ruela de Souza told Agência FAPESP. A lead author of the study, Souza is a postdoctoral researcher at SGC-UNICAMP with a scholarship from FAPESP.The chemical compound used to study the functions of the Wnt signaling pathway was a selective inhibitor of AP2-associated kinase 1 (AAK1) and developed by researchers at SGC-UNICAMP. Previous research has suggested the involvement of AAK1 in endocytosis, the process by which cells internalize substances from their external environment, such as micronutrients and even some viruses and bacteria. Endocytosis is known to play a role in regulating the Wnt signaling pathway, while inhibition of AAK1 appears to reduce its frequency. To validate these hypotheses and investigate the specific function of AAK1 in Wnt signaling, these researchers used the inhibitor as a chemical probe—a small molecule capable of selectively binding to and inhibiting the function of a disease-related protein in a biological model. Analysis of the experimental results showed that AAK1 inhibits beta-catenin-dependent Wnt signaling in cells derived from various tissue types by promoting endocytosis of low-density lipoprotein receptor-related protein 6 (LRP6). A signaling cascade along this pathway begins when the protein Wnt binds to LRP6, which is thereby activated and triggers a sequence of intracellular signals that drive the processes of cellular development, growth and proliferation. Wnt also activates AAK1 in order to switch itself off; this prevents Wtn from proliferating indefinitely and causing problems in the signaling pathway that could give rise to cancer and other diseases. The researchers discovered that AAK1 switches off Wnt by activating endocytosis of LRP6, reducing its presence in the cellular plasma membrane so that it is no longer available to bind to Wnt. "In this manner, AAK1 deactivates the pathway and interrupts the entire signaling cascade," Souza said. Conversely, the researchers found that Wnt signaling is activated by genetic silencing of AAK1 or by pharmacological inhibition with the molecule they developed, which stabilizes the level of beta-catenin in cells. "These discoveries open up the possibility of regulating the activity of this signaling pathway," Souza said. "The chemical compound that inhibits AAK1 can make the pathway more active, for example, by allowing LRP6 to remain in the cellular plasma membrane." The results of the study also confirmed that the AAK1 inhibitor developed by the researchers can indeed be used as a chemical probe and as a precursor for a drug that interferes in endocytosis-dependent processes, such as penetration by certain viruses into the host cell. The researchers plan to collaborate with other groups to study applications of the inhibitor to prevent infections, such as dengue, yellow fever, and Zika, which are caused by arboviruses (viruses transmitted by mosquitoes, ticks and other arthropods). "We know arboviruses can infect cells by means of endocytosis. If we inhibit this pathway using the chemical probe we've developed, it will be possible to block the entry of these viruses into cells," Souza said. In accordance with the open science model used by the SGC to catalyze drug discovery, the AAK1 inhibitor will be placed in the public domain so that researchers at universities, research institutions and pharmaceutical companies can leverage it in studies designed to lead to the development of drugs based on the molecule. "The SGC operates at the beginning of the drug discovery chain. 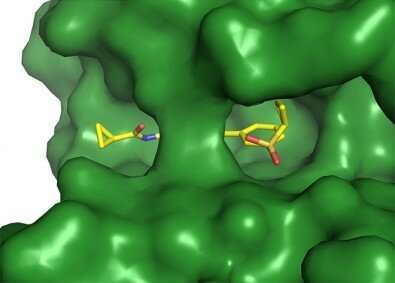 We produce chemical probes for human proteins that can be used as initial molecules for the development of drugs by the pharmaceutical industry," Souza said. Seven other authors of the article besides Souza are affiliated with CQMED and SGC-UNICAMP.